For instance, you are downloading an important file at home but you have to go to work. The download process is already more than a half and canceling it is disappointing and a waste of consumed time. What I suggest is to let it finish and leave your computer open while your at work. And later, you can shutdown you computer remotely from your phone. 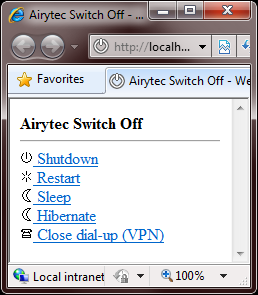 With software like Airytec Switch Off, it is very possible. Switch Off cannot only allow you to remotely shutdown your computer but it can also shutdown, suspend or hibernate your system by itself. These actions can be triggered by countdown timer, schedule, CPU idle, at system start and log on, or by remote control. To connect to it remotely, you need to enter your computer's external IP address followed by the port that you have specified, For example "http://128.77.1.3:8000, where 128.77.1.3 is your IP and 8000 is the port. Use these URL on any web browser even on your mobile phone browser and you'll get to access your PC switch off page. It works on most Windows version including the latest Windows 7.